[XPB-PRF32PERF] Our 32 Gallon Personalized Perforated Receptacle is constructed of heavy duty welded steel. 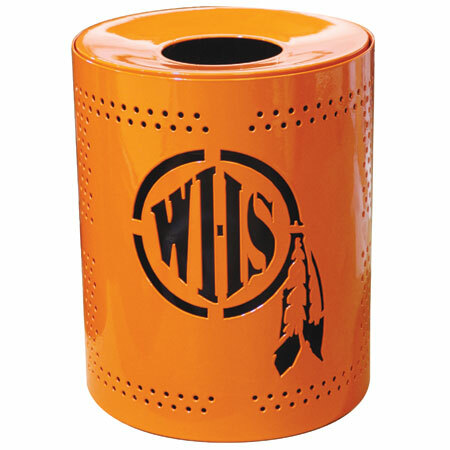 Receptacle features a durable weather resistant colored Termoplastic finish and pre-drilled mounting holes. Waste receptacle is available in 16 color choices (see Color Selects). Optional Lid and Liner sold separately. Customize this product with your logo or text. Send us your logo for a no obligation proof. Customized logo or words cut into steel of receptacle. Excellent advertising for businesses, schools, theme parks, etc. !For shipping quotes, discount pricing, orders or questions please call our Customer Service Center at 1-877-483-9270.